Local architecture and construction consultancy YMD Boon recently tackled the Derby 10k raising a whopping £900 for the Mount Group Riding for the Disabled Association (RDA). The event, which took place on 15 April at Pride Park Stadium in Derby from 9am, welcomed over 5,000 runners on the day. The 13-strong YMD Boon team transformed into super heroes for the challenge including Spiderman, Batman, Wonder Woman and Iron Man to raise money for the Mount Group Riding RDA, which is led by a group of volunteers dedicated to offering the experience and therapeutic benefit of horse riding to children and adults with disabilities. 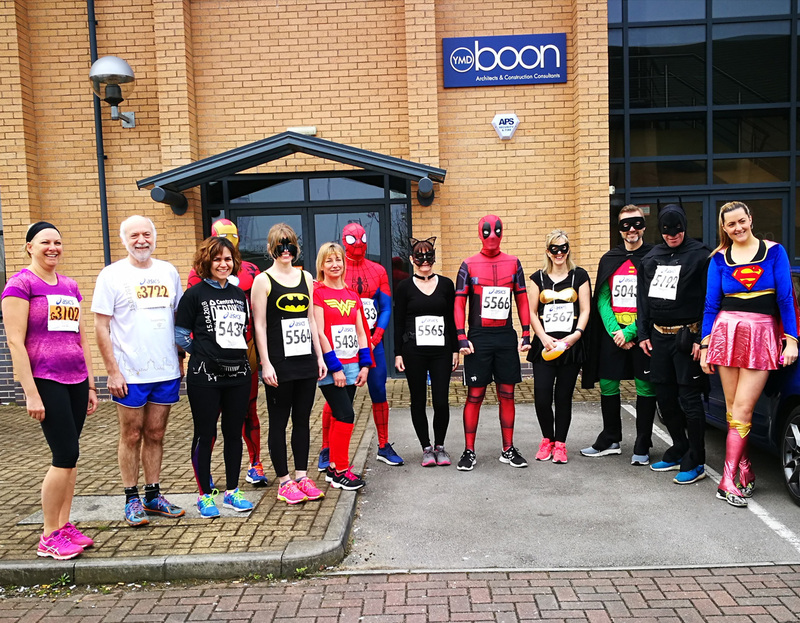 Director at YMD Boon, David Yates, said: “It was fantastic to see so many members of our team take on the Derby 10K to raise money for this important charity, which is close to our hearts. All of the participants pushed themselves to their limits and really got into the spirit of the challenge, smashing the race whilst wearing some interesting costumes. All of the funds raised have gone towards helping Mount Group RDA continue its invaluable work and achieve its goal of providing enjoyable horse riding sessions for children and adults with special needs. A spokesperson for Mount Group RDA said: “At the moment we are giving riding lessons to over 40 disabled children and adults and we run four days a week. The riders come from local schools and residential care homes. We also give private lessons to disabled children and adults, using the riding school horses, ponies and their indoor school. YMD Boon, which celebrates 50 years of business this year, has offices in Nottingham, Derby, Lincoln and Market Harborough and has worked on a number of high-profile schemes throughout the Midlands and nationally.